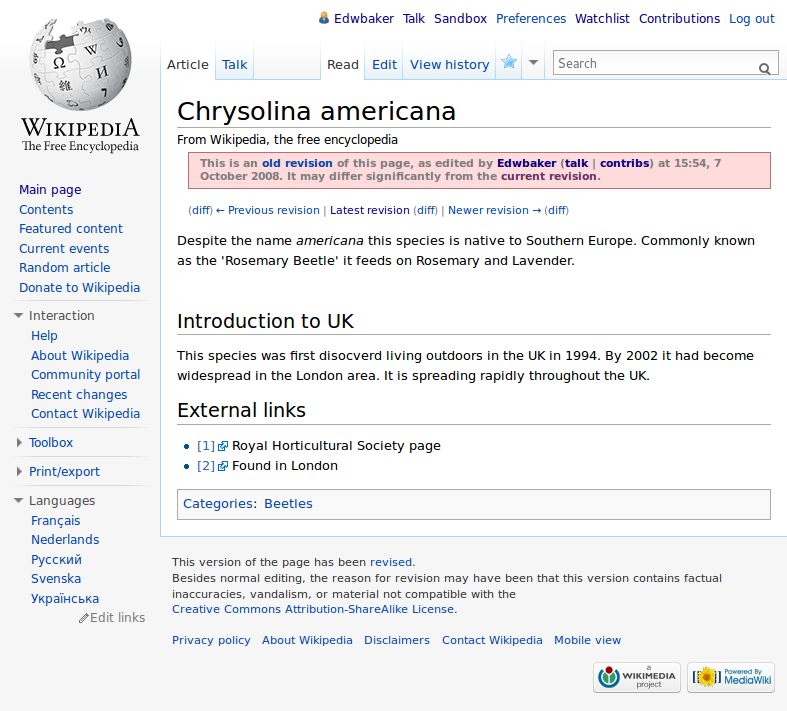 I then forgot all about it, until I started reviewing some of my old Wikipedia edits since we got a Wikipedian in Residence at the Natural History Museum. Since my original and minor contribution the article has grown, although it still could be improved upon greatly. Out of curiosity I pulled up what all of the edits have looked like - it's quite interesting to watch the community come together and make continual gradual improvements. An article is born..... by Ed Baker is licensed under a Creative Commons Attribution-ShareAlike 3.0 Unported License. Once every few weeks I will have a conversation with somebody that goes along the lines of "we're not training any new X-ists and the existing people who know about X will soon retire". Quite often the experts in X have retired already and the main concern is that they will take a huge volume of knowledge to the grave that will take any successor many years to pick up. This is usually combined with some tale of the number of people working on X being in a steady decline. 1) Much, or at least some, of the knowledge a person has will be in their publications. This knowledge will (should) not be lost and is available to the scientific community in perpetuity. 2) Skills such as manual or mental dexterity of any kind require practise, and provided some documentation exists of how to perform the task, repeated practise should do the trick. Perhaps it's dissecting something, perhaps its identifying something using a key. 3) What's left? Unpublished/unpublishable knowledge! It could be argued that this knowledge should be, or should have been, published but that's not really a satisfactory answer. There are pieces of knowledge that in isolation are useful to know, but would not be publishable alone. This knowledge is outside of the concept of a publon, it's a metaphorical quark. Some platforms do exist for getting these ideas down in digital ink - one of the ideas we used to throw around in the early days of Scratchpads was creating a tool for taxonomists to share everything they might know and want to share (a brain dump). It is impossible to predict what will be useful to who, some of the most read posts on this blog are quite arcane in their own way (Processing and USB ports /dev/ttyACM0, /dev/ttyACM1, .... doesn't sound riveting, even to me). The fact is they may be useful to someone - and they don't take long to put online (the blog post I just mentioned was actually as much an aide memoir to myself as an intentional sharing of content). Some may argue that the real skill of an expert is in figuring things out for oneself, and indeed this is a crucial part of becoming an expert in anything. I would argue however that this exploration is potentially more fertile if it is done in the process of creating new knowledge, not just the rediscovery of what people used to know. It's a pleasant surprise then to see that a 104 gardener is sharing his knowledge, learnt over nearly ten decades, to whoever might ask for it: Gardener, 104, takes to Twitter to share horticultural tips. 140 characters is sub-publon in size - but I'm betting the information will still be useful to many. Recently I have been looking at how we measure contributions to science in a way that is more well-rounded than the h-index and similar initiatives. Most of this relates to how we measure a user's contributions to projects such as Scratchpads, ViBRANT and eMonocot. The "alternative metrics" movement has been around for a number of years now, and one of the more established outfits is Altmetric who provide badges for research articles showing how much attention that article has received on a number of purely social (Twitter, Facebook) and 'academic social' (Mendeley, Connotea) networks. As the badges are pretty easy to implement I have made a small Drupal module that displays an Altmetric badge on Biblio node pages, and provides a configuration page to allow the badges to be customised. 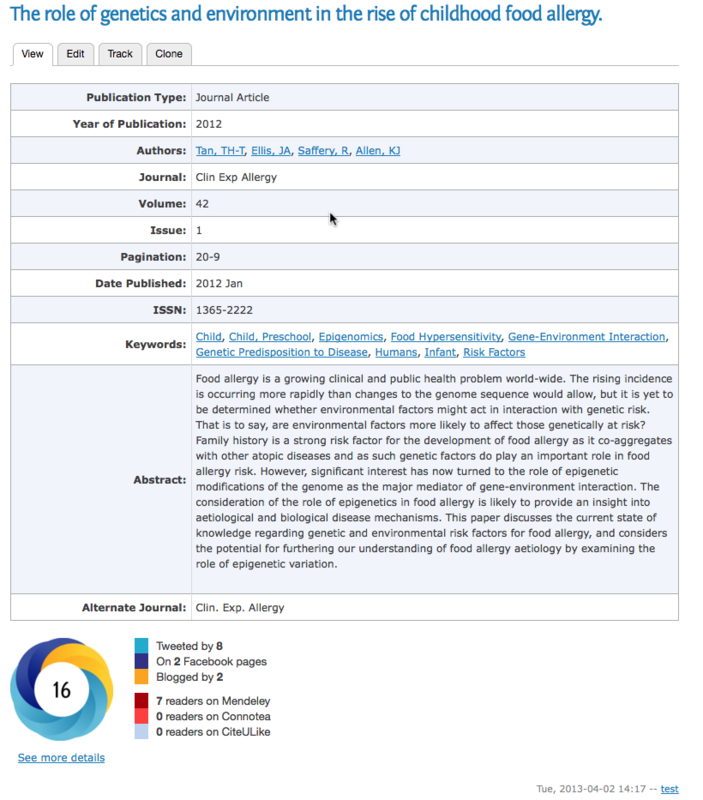 The module is available here: Drupal biblio altmetric.